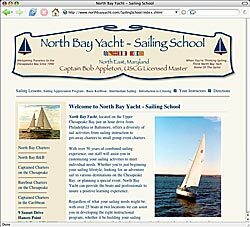 North Bay Inc,: Bed and Breakfast, Sailing School and Charters. 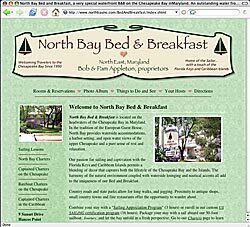 North Bat Bed and Breakfast is a very special waterfront B&B on the Chesapeake Bay in Maryland. An outstanding water front Bed and Breakfast with a touch of the Florida Keys, located in North East, Maryland at the headwaters of the Chesapeake Bay, offering sailing lessons and charters. 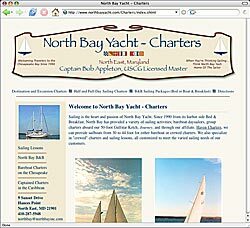 North Bay Yacht provides waterside Bed & Breakfast lodging and sailing on the Chesapeake Bay. We provide water view accommodations, individualized sailing instruction, and sailboat charters all from our harbor setting on the North East River on the upper Chesapeake Bay. Package your waterside stay with sailing instruction or sailing charter. B&B = Vacation on the Bay. Sailing = Experiencing the adventure. Our sailboat charters can be packaged with a stay at the our B&B or chose the adventure of a Destination Charter. Be part of the sailing or leave the sailing to us.